Married Name 14 April 1909 As of 14 April 1909,her married name was Schrank. Married Name 24 November 1949 As of 24 November 1949,her married name was Schulenburg. Louise M. Schroeder was born at Wisconsin on 14 April 1891; also reported as 14 Apr 1890. She was the daughter of William K. Schroeder and Bertha Krause. Louise M. Schroeder married William H. Schrank, son of William Charles Frederick Schrank and Matilda Augusta Koepp, on 14 April 1909. Louise M. Schroeder became the godmother at Ester Meta Bertha Rathmann's christening on 29 March 1914 at St John Lutheran Church, Reedsburg, Sauk, Wisconsin. Louise M. Schroeder married Otto Schulenburg, son of Ferdinand Schulenberg and Kate (? ), on 24 November 1949. 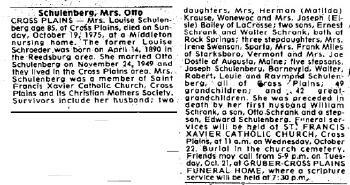 Louise M. Schroeder died on 19 October 1975 at Middleton, Wisconsin, at age 84 Mrs Otto Schulenburg (Louise Schroeder Schrank) obituary. Louise M. Schroeder obtained US Social Security Card at Wisconsin; last residence Cross Plains, Dane, Wisconsin. In March 1926 at at the Henry Schrank home, Sauk, Wisconsin, Schrank family reunion; guest of honor William Schrank Sr. Schrank family gathering - sisters and sisters-in-law including Louise (Schrank) Friede circa 1940s. [S214] Wisconsin Sauk Co Cemetery Records Vol 9, Pg 149. [S245] U.S. Federal Census 1900 U.S. Federal Census, by Ancestry.com, ED143. Dwelling 159. [S244] U.S. Federal Census 1910 U.S. Federal Census, by Ancestry.com, ED123. Dwelling 29. [S243] U.S. Federal Census 1920 U.S. Federal Census, by Ancestry.com, ED 174. Stamp 174. Sheet 7A. Dwelling 172. Family 152. [S250] U.S. Federal Census 1930 U.S. Federal Census, by Ancestry.com, ED56-29. Dwelling 135. Ward 1. [S373] U.S. Federal Census 1940 U.S. Federal Census, by Ancestry.com, Year: 1940; Census Place: Reedsburg, Sauk, Wisconsin; Roll: T627_4523; Page: 2A; Enumeration District: 56-31B. Name Variation Matilda Martha Emilia Schrank was also known as Tilly. Name Variation Matilda Martha Emilia Schrank was also known as Mathilda E.
Nickname Matilda Martha Emilia Schrank also went by the name of Tillie. Married Name circa 1927 As of circa 1927,her married name was Krause. 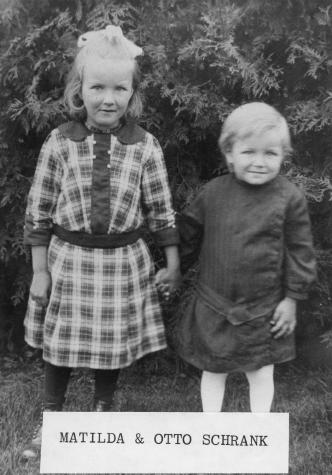 Matilda Martha Emilia Schrank was born on 23 May 1909 at Reedsburg, Sauk, Wisconsin. She was the daughter of William H. Schrank and Louise M. Schroeder. Matilda Martha Emilia Schrank married Herman Krause, son of Frank Krause and Marie Rick, circa 1927. 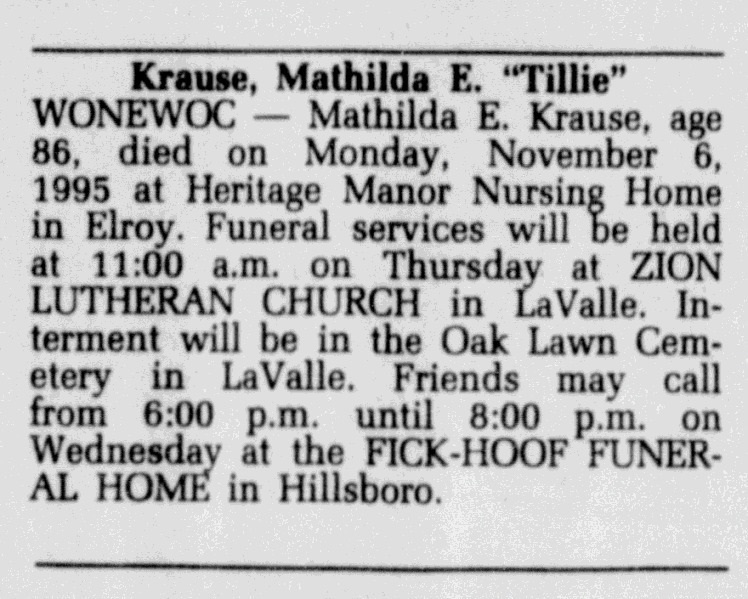 Matilda Martha Emilia Schrank died on 6 November 1995 at Elroy, Juneau, Wisconsin, at age 86 Mathilda (Schrank) Krause obituary; also reported as Texas. Portrait of siblings Matilda and Otto Schrank circa 1915. [S250] U.S. Federal Census 1930 U.S. Federal Census, by Ancestry.com, Year: 1930; Census Place: Woodland, Sauk, Wisconsin; Roll: 2609; Page: 5A; Enumeration District: 0041; Image: 559.0; FHL microfilm: 2342343. Otto Emil Schrank was born on 27 September 1912 at Reedsburg, Sauk, Wisconsin. He was the son of William H. Schrank and Louise M. Schroeder. 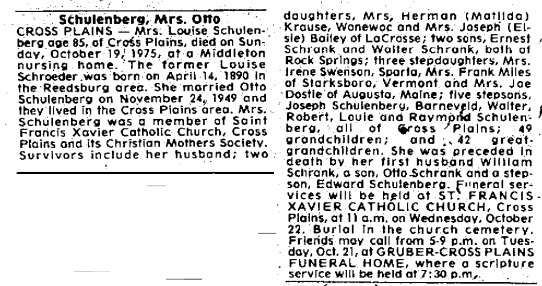 Otto Emil Schrank married Melvina Solchenberger, daughter of Peter Solchenberger and Florence Malvina Engwall, on 30 July 1941 at Reedsburg, Sauk, Wisconsin, also reported as 07 Aug 1941. Otto Emil Schrank died on 16 December 1967 at LaValle, Sauk, Wisconsin, at age 55 Otto Schrank obituary. He was buried after 16 December 1967 at Oak Lawn Cemetery, LaValle, Sauk, Wisconsin. On 22 July 1960 at Shields Family Reunion, Madison, Dane, Wisconsin, The sixth Shields family reunion was held Sunday at the Fish Hatchery Park in Madison. 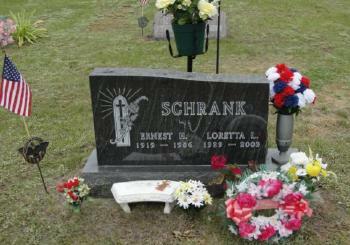 Ernest August Henry Schrank was born on 2 February 1919 at Reedsburg, Sauk, Wisconsin. Ernest August Henry Schrank married Loretta Louise Anna Marie Schaefer, daughter of Edward Schaefer and Rosina Lenz, on 3 August 1952 at Rock Springs, Rock, Wisconsin, Loretta Schaeffer and Ernest Schrank engagement announcement. Ernest August Henry Schrank died on 15 February 1986 at Reedsburg, Sauk, Wisconsin, at age 67 Ernest Schrank obituary. He was buried after 15 February 1986 at Saint Johns Cemetery, Rock Springs, Rock, Wisconsin. Married Name 16 May 1943 As of 16 May 1943,her married name was Bailey. Elsie Anna Louise Schrank was born on 5 February 1922 at Reedsburg, Sauk, Wisconsin. Elsie Anna Louise Schrank married Joseph Benjamin Bailey, son of Victor Bailey and Lydia Karstetter, on 16 May 1943 at Reedsburg, Sauk, Wisconsin. Elsie Anna Louise Schrank died on 16 April 2008 at La Crosse, Wisconsin, at age 86 Elsie A. Bailey, 86, of La Crosse died Wednesday, April 16, 2008, at Gundersen Lutheran Medical Center, La Crosse. Elsie was born Feb. 5, 1922, in Reedsburg, Wis., to William and Louise Schrank. 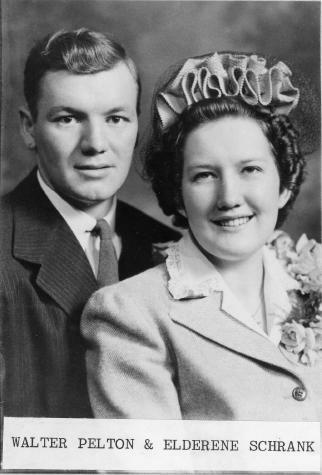 On May 16, 1943, she married Joseph Bailey in Reedsburg, and they moved to La Crosse in 1947. Elsie was employed in housekeeping for Gundersen Lutheran Medical Center in La Crosse from 1970 until 1985. On Dec. 2, 2004, Joseph preceded Elsie in death. Survivors include one daughter, four sons, one daughter-in-law, 12 grandchildren; nine great-grandchildren; one stepgranddaughter; one stepgrandson; and five stepgreat-grandchildren. In addition to her husband, Elsie was preceded in death by her parents; her son, Donald Earl Bailey; one sister; and three brothers. Funeral services will be Monday, April 21, at 11 a.m. at Wesley United Methodist Church, Eighth and King streets, La Crosse. The Rev. Don Iliff will officiate. Burial will be in Oaklawn Cemetery, La Valle, Wis. Friends may call at the church on Monday from 9:30 a.m. until the time of services. Woodruff-Jandt Funeral Home, La Crosse, is in charge of arrangements. She was buried on 21 April 2008 at Oak Lawn Cemetery, La Valle, Sauk, Wisconsin. 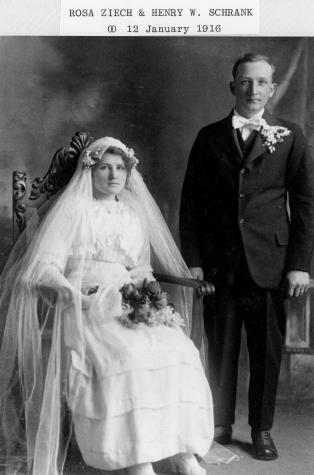 Walter Edwin Paul Schrank married Alvina H. Schaefer. Walter Edwin Paul Schrank was born on 1 October 1925 at Reedsburg, Sauk, Wisconsin. 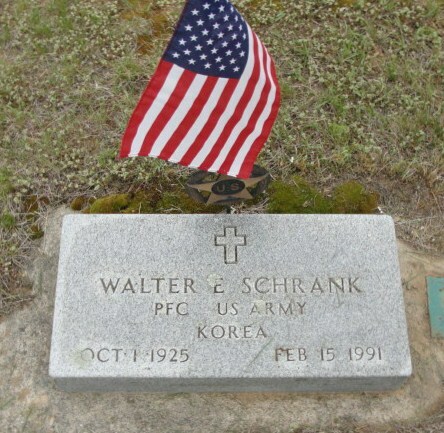 Walter Edwin Paul Schrank witnessed the death of William H. Schrank on 3 April 1944 at Sauk, Wisconsin; Tractor Upsets, Kills Schrank - William H Schrank obituary. Walter Edwin Paul Schrank died on 15 February 1991 at Baraboo, Sauk, Wisconsin, at age 65 Walter E Schrank obituary. 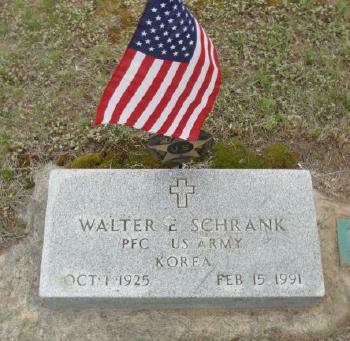 He was buried after 15 February 1991 at Saint Johns Cemetery, Rock Springs, Sauk, Wisconsin, Korea PFC U S Army. 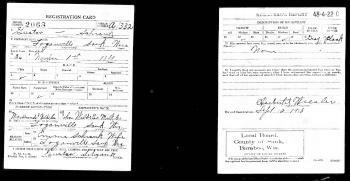 Walter Edwin Paul Schrank obtained US Social Security Card at Wisconsin; last residence not specified. 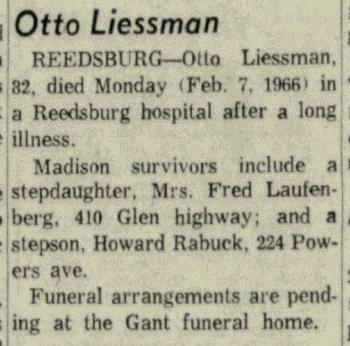 Name Variation Otto Frank Liessman was also known as O. F.
Otto Frank Liessman was born at Wisconsin on 16 December 1883. He was the son of Henry J. Liessman and Catherine Ohland. 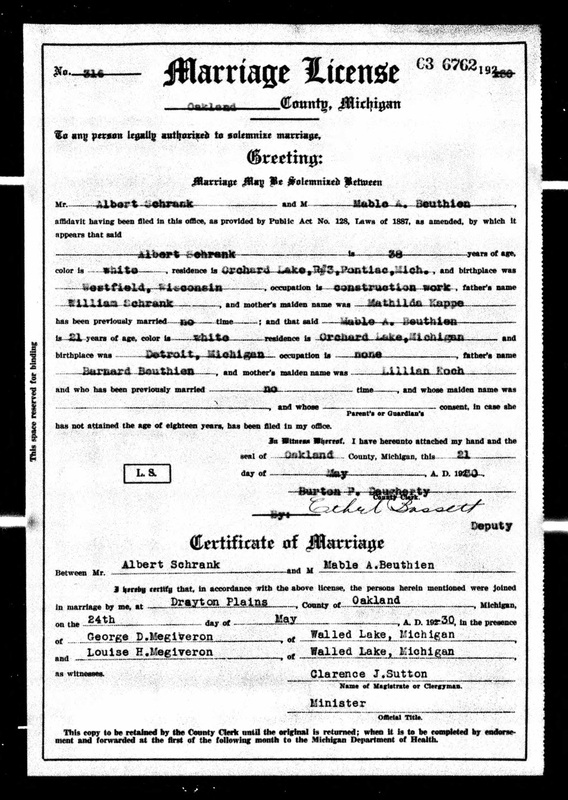 Otto Frank Liessman married Lillian Inman after 1954. Otto Frank Liessman died on 7 February 1966 at Reedsburg, Sauk, Wisconsin, at age 82 Otto Liessman obituary. Otto Frank Liessman obtained US Social Security Card at Wisconsin; Last residence Reedsburg, Sauk, Wisconsin.. In July 1925 at Lake Mills, Wisconsin, attended Liessman family reunion. [S387] Family Search; Multiple Records, "Wisconsin, County Marriages, 1836-1911," database, FamilySearch (https://familysearch.org/ark:/61903/1:1:XRFL-PSF : 3 June 2016), Koepp in entry for Otto Frank Leissman and Tillie Schrank, 31 Oct 1903; citing , Sauk, Wisconsin, United States, Wisconsin Historical Society, Madison; FHL microfilm 1,275,562. [S245] U.S. Federal Census 1900 U.S. Federal Census, by Ancestry.com, ED142. Dwelling 359. [S244] U.S. Federal Census 1910 U.S. Federal Census, by Ancestry.com, ED123. Dwelling 199. [S243] U.S. Federal Census 1920 U.S. Federal Census, by Ancestry.com, ED174. Dwelling 257. [S250] U.S. Federal Census 1930 U.S. Federal Census, by Ancestry.com, ED56-29. Dwelling 309. [S373] U.S. Federal Census 1940 U.S. Federal Census, by Ancestry.com, Year: 1940; Census Place: Reedsburg, Sauk, Wisconsin; Roll: T627_4523; Page: 5A; Enumeration District: 56-31A. 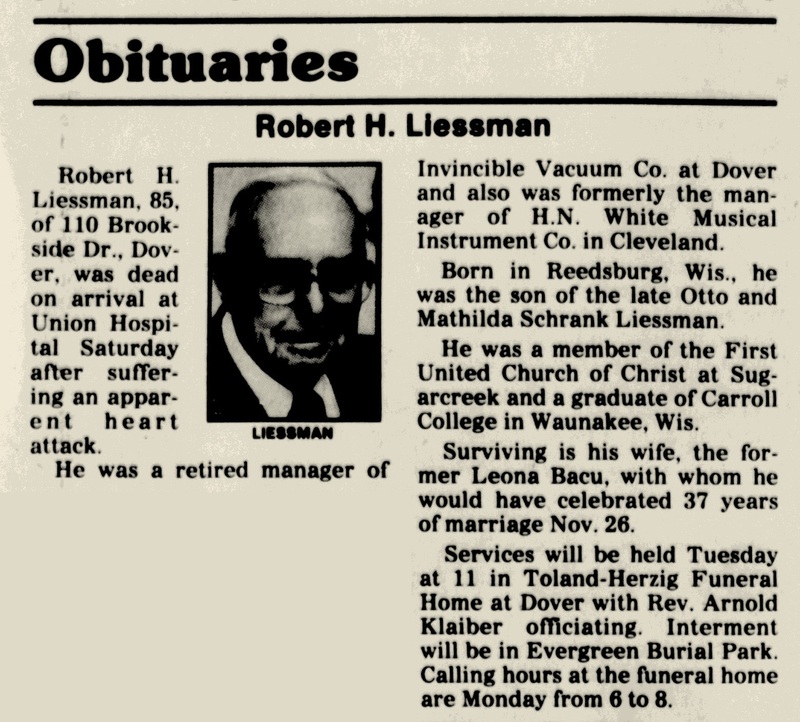 Name Variation Robert Henry Liessman was also known as Bob. Name Variation Robert Henry Liessman was also known as R. H.
He was the son of Otto Frank Liessman and Matilda Schrank. Robert Henry Liessman married Leona E. Bacu, daughter of Leon Bacu and Pauline T. Collins, on 26 November 1952. 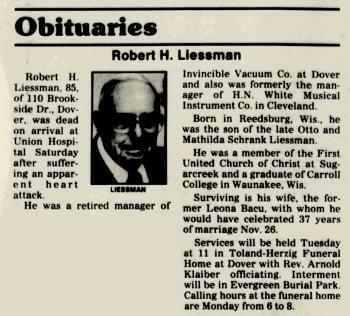 Robert Henry Liessman died on 30 September 1989 at Tuscarawas, Ohio, at age 85 Robert Henry (R H) Liessman obituary. Robert Henry Liessman obtained US Social Security Card at Ohio; Last residence Dover, Tuscarawas, Ohio.. 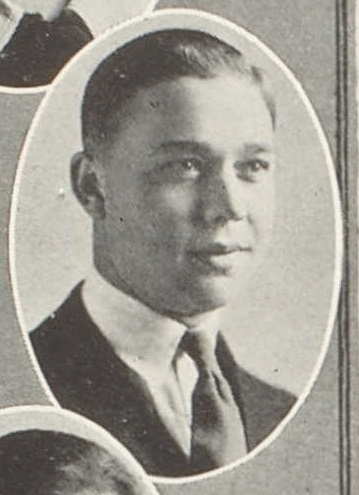 He graduated in 1922 at Reedsburg High School, Reedsburg, Sauk, Wisconsin. 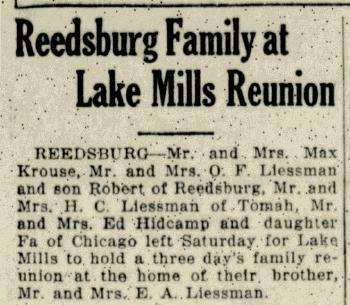 In July 1925 at Lake Mills, Wisconsin, attended Liessman family reunion. [S6] Wisconsin, Wisconsin Vital Record to 1907, Reel 0266 Record 002280. [S373] U.S. Federal Census 1940 U.S. Federal Census, by Ancestry.com, Year: 1940; Census Place: Los Angeles, Los Angeles, California; Roll: T627_378; Page: 83A; Enumeration District: 60-740. Married Name 24 May 1930 As of 24 May 1930,her married name was Schrank. Married Name after 1944 As of after 1944,her married name was Franklin. Mable A. Beuthien was born on 25 November 1909 at Detroit, Michigan, also reported as 25 Nov 1910. She was the daughter of Bernhard Beuthien and Lillian Koch. 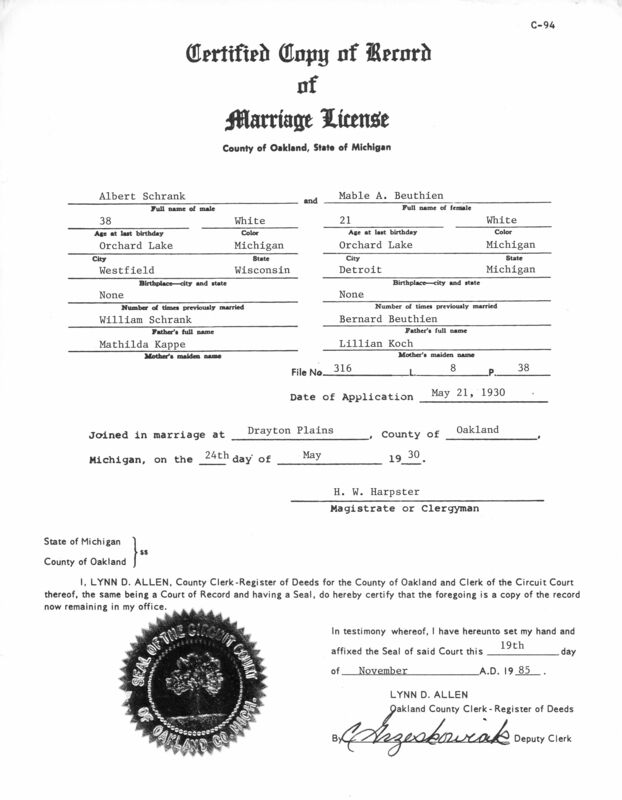 Mable A. Beuthien and Albert Schrank obtained a marriage license on 21 May 1930 at Oakland, Michigan, Mable A Beuthien and Albert Schrank marriage license. Mable A. Beuthien married Albert Schrank, son of William Charles Frederick Schrank and Matilda Augusta Koepp, on 24 May 1930 at Drayton Plains, Oakland, Michigan, Schrank and Beuthien Marriage Certificate. Mable A. Beuthien married (?) Franklin after 1944. Mable A. Beuthien and Albert Schrank lived in 1938 at 3208 Maple, Keego Harbor, Oakland, Michigan. 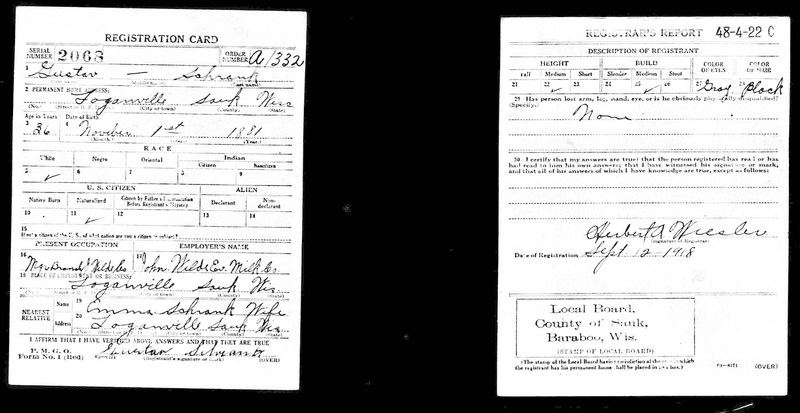 Mable A. Beuthien lived on 30 January 1944 at Keego Harbor, Oakland, Michigan. 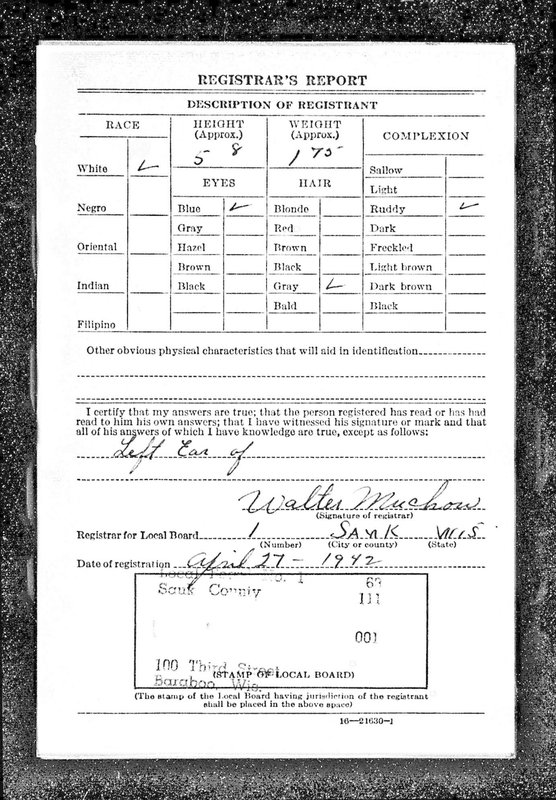 [S243] U.S. Federal Census 1920 U.S. Federal Census, by Ancestry.com, Year: 1920; Census Place: West Bloomfield, Oakland, Michigan; Roll: T625_790; Page: 3B; Enumeration District: 208; Image: 991. [S373] U.S. Federal Census 1940 U.S. Federal Census, by Ancestry.com, Year: 1940; Census Place: Keego Harbor, Oakland, Michigan; Roll: T627_1804; Page: 27A; Enumeration District: 63-189. Nickname Rosa Anna Henrietta Ziech also went by the name of Rose. Married Name 12 January 1916 As of 12 January 1916,her married name was Schrank. Rosa Anna Henrietta Ziech was born at Wisconsin on 10 October 1896. She was the daughter of Fredrich Wilhelm Ziech Sr. and Karoline Mittlesteadt. 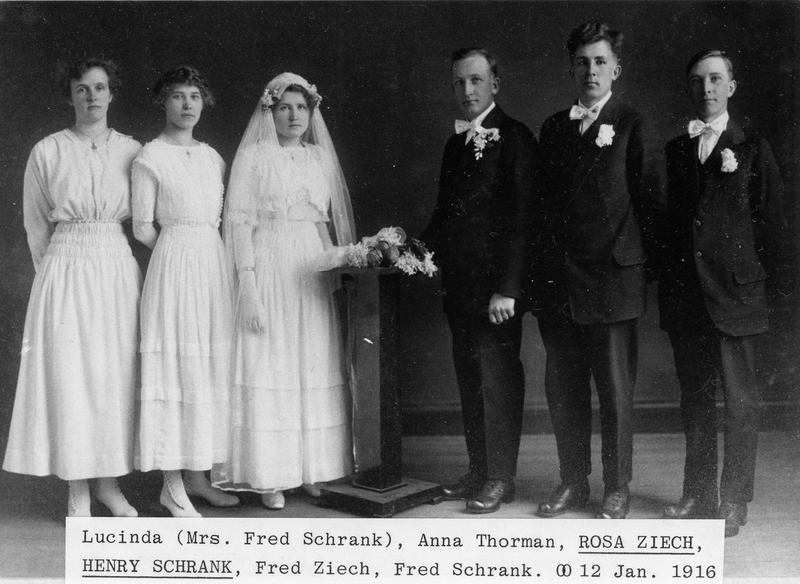 Rosa Anna Henrietta Ziech married Henry William Schrank, son of William Charles Frederick Schrank and Matilda Augusta Koepp, on 12 January 1916 at St. Peter's Lutheran Church, Reedsburg, Sauk, Wisconsin. Rosa Anna Henrietta Ziech died on 24 August 1957 at age 60 Mrs Henry Schrank (Rosa Ziech) obituary. On 12 January 1917 Henry and Rosa (Ziech) Schrank celebrate first wedding anniversary. In March 1926 at at the Henry Schrank home, Sauk, Wisconsin, Schrank family reunion; guest of honor William Schrank Sr. Henry and Rosa (Zieck) Schrank Family Portrait from the 1940s. [S243] U.S. Federal Census 1920 U.S. Federal Census, by Ancestry.com, ED176. Sheet 1A. Stamp 199A line 4 Farm 83. [S373] U.S. Federal Census 1940 U.S. Federal Census, by Ancestry.com, Year: 1940; Census Place: Reedsburg, Sauk, Wisconsin; Roll: T627_4523; Page: 3A; Enumeration District: 56-33. Name Variation Elderene Elisabeth May Schrank was also known as Elderine. Name Variation Elderene Elisabeth May Schrank was also known as Elderence. Married Name 1942 As of 1942,her married name was Pelton. Married Name 11 July 1956 As of 11 July 1956,her married name was Brooks. Elderene Elisabeth May Schrank was born on 20 May 1917 at Reedsburg, Sauk, Wisconsin. She was the daughter of Henry William Schrank and Rosa Anna Henrietta Ziech. Elderene Elisabeth May Schrank married Walter Losey Pelton in 1942. Elderene Elisabeth May Schrank married Harvey Alfred Brooks, son of Fred Walter Brooks and Ida Marian Braun, on 11 July 1956. Elderene Elisabeth May Schrank died on 3 January 2015 at Reedsburg, Sauk, Wisconsin, at age 97 Elderene Brooks, age 97, of Reedsburg, died Saturday, January 3, 2015, at her residence. 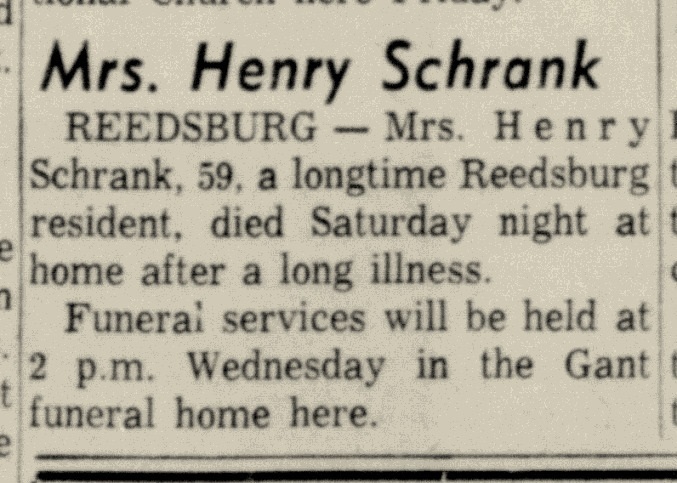 She was born May 20, 1917 in Sauk County, the daughter of Henry and Rose (Ziech) Schrank. She married Walter Pelton in 1942. On July 11, 1956, she was united in marriage to Harvey Brooks. Elderene would walk from home to her country school and later to St. Peter’s Lutheran School as a child; and going to church on Sunday morning meant a trip with the use of horse and buggy or by sleigh in the winter. She was known by others for her smile and laugh, her huge gardens along with her enjoyment of being a serious card player, either Euchre, 500 or Sheeps Head. She loved her children and would do devotions with them every morning and evening throughout their years growing up. She was also the Treasurer for Willow Heights for over 23 years and was recognized for her time she provided doing that work. 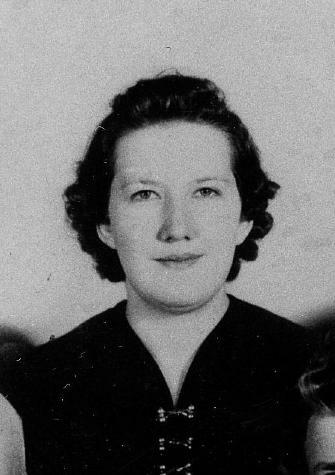 She is survived by her children; Gerald (Georgia) Pelton of Shoreview, Minnesota, and Gloria (David) Eaton of Grafton, Wisconsin, grandchildren; Nicholas Wolfgram, Christi Lawrence, and Michael Pelton, great-grandchildren; Brant, Darby and Graham, step-great-grandchildren; David and Kaylin, a brother Arnold (Dorothy) Schrank of Reedsburg, brothers-in-law; James (Ardel) Pelton, Lee (Beverly) Pelton, sisters-in-law, Vera Pelton, Esther (Lewis) Massey, along with many nieces and nephews, and other relatives and friends. 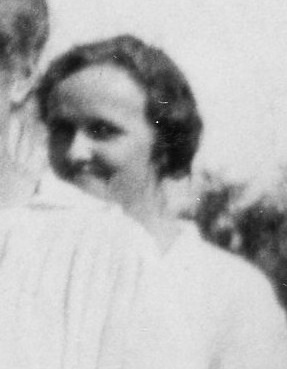 She was preceded in death by her parents, Henry and Rose Schrank ; husband Harvey, and brother Gilbert (Loretta) Schrank, brothers and sisters –in-law Montross (Ginny) Pelton, Darrel (Marion) Higgins, Keith Pelton, Katherine Pelton; nieces, Nan Pelton, Deanna Imhoff, and Sharon Higgins. Elderene was a faithful member of Saint Peter’s Lutheran Church where she was baptized, confirmed and married. She was active in Ladies Aid, Bible Study, Golden Agers, and Women’s’ Missionary League. Early in her life, Elderene worked at the Huntley Hotel in Reedsburg. She was a devoted farm wife and mother. In 1962, Elderene worked at Jimmies Del Bar in Wisconsin Dells. Elderene and Harvey moved to Reedsburg in 1964, where for the next 20 years she was employed as a cook at the Reedsburg Hospital; retiring in 1984. Elderene was known for her cooking great meals and her baking skills, especially her many pies .which were appreciated by all who knew her. Funeral services for Elderene will be Thursday, January 8, 2015, at 11:00 A.M. in St. Peter’s Lutheran Church, Reedsburg with Pastor Paul Crolius officiating. Visitation will be on Wednesday at Farber Funeral Home from 5-7 P.M. and again on Thursday at the church from 10:00 A.M. until the time of service. Burial will follow services at St. Peter’s Lutheran Cemetery in Reedsburg. In Lieu of flowers the family would prefer memorials be given to St. Peter’s Lutheran Church or the Lutheran Hour. 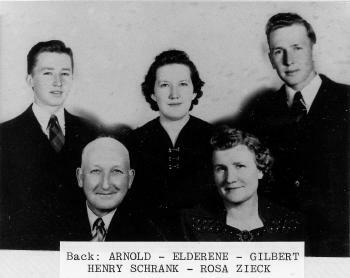 Henry and Rosa (Zieck) Schrank Family Portrait from the 1940s. Elderene Elisabeth May Schrank lived in April 2011 at Reedsburg, Sauk, Wisconsin. 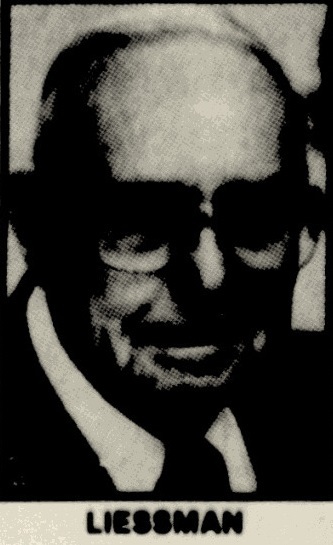 Gilbert Henry Schrank was born on 11 December 1918 at Reedsburg, Sauk, Wisconsin. He was the son of Henry William Schrank and Rosa Anna Henrietta Ziech. 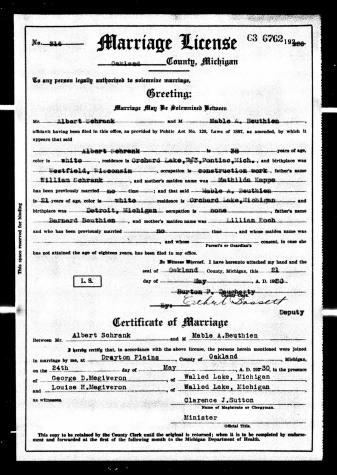 Gilbert Henry Schrank married Dorothy M. Willie on 28 December 1947. Gilbert Henry Schrank married Loretta L. Koenecke, daughter of Albert E. Koenecke and Dorothea Harms, on 13 February 1971. Gilbert Henry Schrank died on 14 November 1999 at at home, Reedsburg, Sauk, Wisconsin, at age 80 Gilbert Henry Schrank obituary. Gilbert Henry Schrank obtained US Social Security Card at Wisconsin; last residence Reedsburg, Sauk, Wisconsin. He graduated in 1936 at Reedsburg High School, Reedsburg, Sauk, Wisconsin. Henry and Rosa (Zieck) Schrank Family Portrait from the 1940s. Married Name 8 May 1918 As of 8 May 1918,her married name was Schrank. 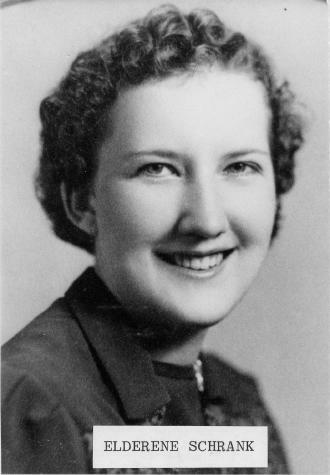 Lucinda Pauline Caroline Grotelueschen was born at Wisconsin on 21 October 1894. She was the daughter of Heinrich Grotelueschen and Emilia Rossow. Lucinda Pauline Caroline Grotelueschen married Frederick Edward Schrank, son of William Charles Frederick Schrank and Matilda Augusta Koepp, on 8 May 1918 at St. Peter's Lutheran Church, Reedsburg, Sauk, Wisconsin. 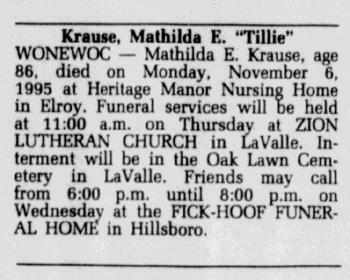 Lucinda Pauline Caroline Grotelueschen witnessed the death of Emilia Rossow on 17 August 1944 at Reedsburg, Sauk, Wisconsin; Emelie (Rossow) Grotelueschen obituary. 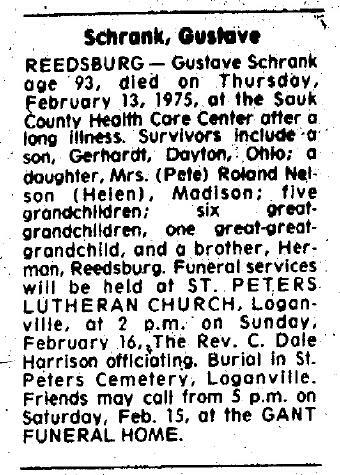 Lucinda Pauline Caroline Grotelueschen died on 23 September 1972 at at hospital, Wisconsin, at age 77 Mrs Fred Schrank (Lucinda Grotelueschen) obituary. Lucinda Pauline Caroline Grotelueschen obtained US Social Security Card at Wisconsin; last residence Reedsburg, Sauk, Wisconsin. In March 1926 at at the Henry Schrank home, Sauk, Wisconsin, Schrank family reunion; guest of honor William Schrank Sr. Schrank family gathering - sisters and sisters-in-law including Louise (Schrank) Friede circa 1940s. [S245] U.S. Federal Census 1900 U.S. Federal Census, by Ancestry.com, ED130. Dwelling 25. [S364] Wisconsin State Census Wisconsin State Censuses, 1895 and 1905, by Ancestry.com, Dwelling 46. [S244] U.S. Federal Census 1910 U.S. Federal Census, by Ancestry.com, ED125. Dwelling 203. [S243] U.S. Federal Census 1920 U.S. Federal Census, by Ancestry.com, ED176. Dwelling 138. Sheet 8B. Stamp 207A line 27. [S250] U.S. Federal Census 1930 U.S. Federal Census, by Ancestry.com, ED56-31. Dwelling 168. [S373] U.S. Federal Census 1940 U.S. Federal Census, by Ancestry.com, Year: 1940; Census Place: Reedsburg, Sauk, Wisconsin; Roll: T627_4523; Page: 8A; Enumeration District: 56-33. 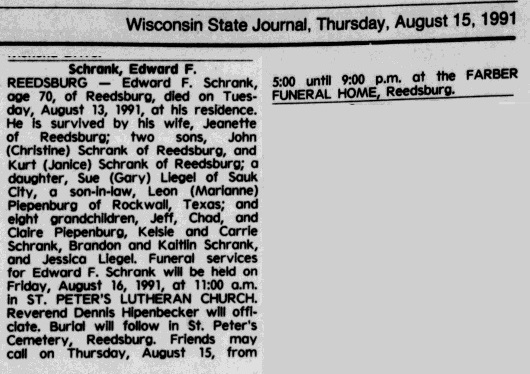 Edward Frederick Schrank was born on 31 July 1921 at Reedsburg, Sauk, Wisconsin. He was the son of Frederick Edward Schrank and Lucinda Pauline Caroline Grotelueschen. Edward Frederick Schrank married Jeanette A. Felske, daughter of Ralph Herman Felske and Ruby May Greenwood, on 12 July 1946. 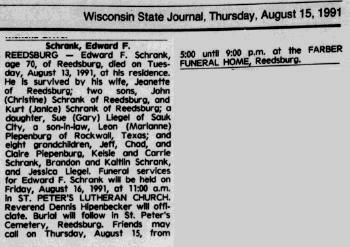 Edward Frederick Schrank died on 13 August 1991 at Reedsburg, Sauk, Wisconsin, at age 70 Edward F Schrank obituary. He was buried after 13 August 1991 at Saint Peters Lutheran Cemetery, Reedsburg, Sauk, Wisconsin. Edward Frederick Schrank obtained US Social Security Card at Wisconsin; last residence Reedsburg, Sauk, Wisconsin. In March 1926 at at the Henry Schrank home, Sauk, Wisconsin, Schrank family reunion; guest of honor William Schrank Sr. He graduated in 1939 at Reedsburg High School, Reedsburg, Sauk, Wisconsin. 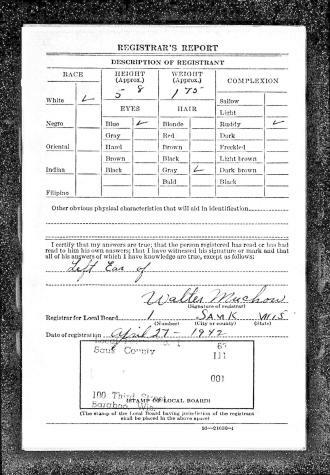 On 13 November 1942 at U.S. World War II Army Enlistment, Milwaukee, Wisconsin, Name: Edward F Schrank Birth Year: 1921 Race: White, citizen (White) Nativity State or Country: Wisconsin State: Wisconsin County or City: Sauk Enlistment Date: 13 Nov 1942 Enlistment State: Wisconsin Enlistment City: Milwaukee Branch: Branch Immaterial - Warrant Officers, USA Branch Code: Branch Immaterial - Warrant Officers, USA Grade: Private Grade Code: Private Term of Enlistment: Enlistment for the duration of the War or other emergency, plus six months, subject to the discretion of the President or otherwise according to law Component: Selectees (Enlisted Men) Source: Civil Life Education: 4 years of high school Civil Occupation: Bridge Builder (Bridge carpenter. ) or Car Carpenter, Railway or Carpenter, Construction* (Carpenter, general.) or Carpenter, Ship An asterisk (*) appearing after a job title indicates that a trade test for the particular occupation will be found in the U Marital Status: Single, without dependents Height: 67 Weight: 135. Married Name circa 1878 As of circa 1878,her married name was Schrank. Bertha Roloff was born at Germany in January 1861. She married Ferdinand Schrank, son of Gottfried Schrank and Ernestine Henretta Wilhelmine Tessmann, circa 1878 at Germany. 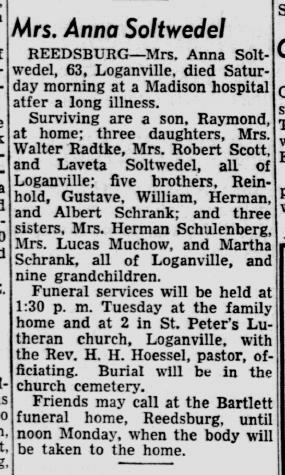 Bertha Roloff died on 21 March 1947 at at home, Loganville, Sauk, Wisconsin, at age 86 Mrs Bertha (Roloff) Schrank obituary. Bertha Roloff had 9 with 8 living in 1900 children. She had 10 with 9 living in 1900 children. She was naturalized in 1914. 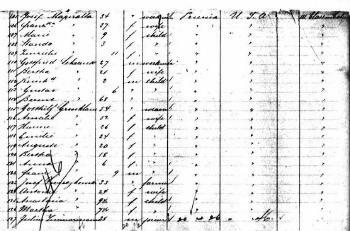 [S245] U.S. Federal Census 1900 U.S. Federal Census, by Ancestry.com, Sheet 4A. Stamp 140. Dwelling 36. ED 149. [S364] Wisconsin State Census Wisconsin State Censuses, 1895 and 1905, by Ancestry.com, Dwelling 34. [S244] U.S. Federal Census 1910 U.S. Federal Census, by Ancestry.com, Dwelling . ED 130. [S243] U.S. Federal Census 1920 U.S. Federal Census, by Ancestry.com, ED171. Sheet 10B. Dwelling 204. [S250] U.S. Federal Census 1930 U.S. Federal Census, by Ancestry.com, ED56-22. Sheet 1A. Dwelling 5. [S373] U.S. Federal Census 1940 U.S. Federal Census, by Ancestry.com, Year: 1940; Census Place: Loganville, Sauk, Wisconsin; Roll: T627_4523; Page: 1A; Enumeration District: 56-23. 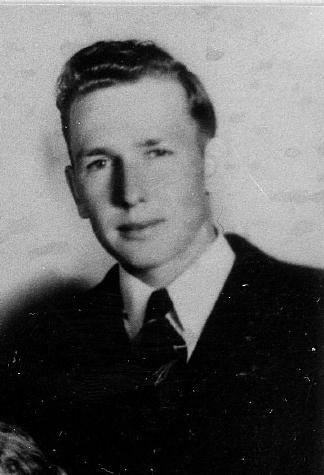 Name Variation Reinhard G. Schrank was also known as Reinholt Fred. Name Variation Reinhard G. Schrank was also known as Reinhold. Reinhard G. Schrank was born at Germany on 11 February 1880. He was the son of Ferdinand Schrank and Bertha Roloff. As of 1930, Reinhard G. Schrank was never married. 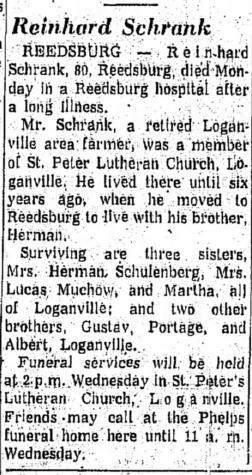 He died on 1 August 1960 at age 80 Reinhard Schrank obituary. Elva E. 1902 - 1977 (Wife of Herman E.). Ship Name: Donau. Reinhard G. Schrank witnessed the naturalization of Bertha Roloff in 1914. Reinhard G. Schrank was naturalized on 2 June 1914 at Circuit Court, Baraboo, Sauk, Wisconsin, residence: Westfield, Sauk, Wisconsin. 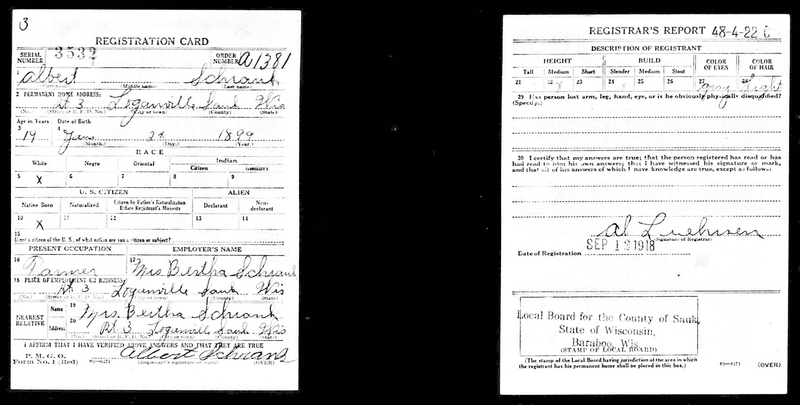 On 12 September 1918 at WWI Registration, Sauk, Wisconsin. [S245] U.S. Federal Census 1900 U.S. Federal Census, by Ancestry.com, ED137. Dwelling 60. [S250] U.S. Federal Census 1930 U.S. Federal Census, by Ancestry.com, ED56-39. Dwelling 144. Name Variation Gustave Reinhold Schrank was also known as Gus. Name Variation Gustave Reinhold Schrank was also known as Schranke. Name Variation Gustave Reinhold Schrank was also known as August. Name Variation Gustave Reinhold Schrank was also known as Gustav. Gustave Reinhold Schrank was born at Germany on 1 November 1881. Gustave Reinhold Schrank married Emma Steckelberg, daughter of Henry Steckelberg and Catherine Meyer, on 27 September 1905 at St. Peter's Lutheran Church, Loganville, Sauk, Wisconsin. Gustave Reinhold Schrank died on 13 February 1975 at age 93 Gustave Schrank obituary. Ship Name: Donau. Gustave Reinhold Schrank was naturalized on 2 June 1914 at Circuit Court, Baraboo, Sauk, Wisconsin, residence: Loganville, Wisconsin. On 12 September 1918 at WWI Registration, Sauk, Wisconsin. In 1942 at World War II Draft Registration, Sauk, Wisconsin. [S245] U.S. Federal Census 1900 U.S. Federal Census, by Ancestry.com, ED134. Dwelling 46. [S244] U.S. Federal Census 1910 U.S. Federal Census, by Ancestry.com, ED 130. Sheet 1A. Dwelling 13. [S243] U.S. Federal Census 1920 U.S. Federal Census, by Ancestry.com, Stamp 129. Dwelling 3. [S250] U.S. Federal Census 1930 U.S. Federal Census, by Ancestry.com, ED56-22. Sheet 1A. Dwelling 11. Married Name 16 August 1911 As of 16 August 1911,her married name was Schulenburg. 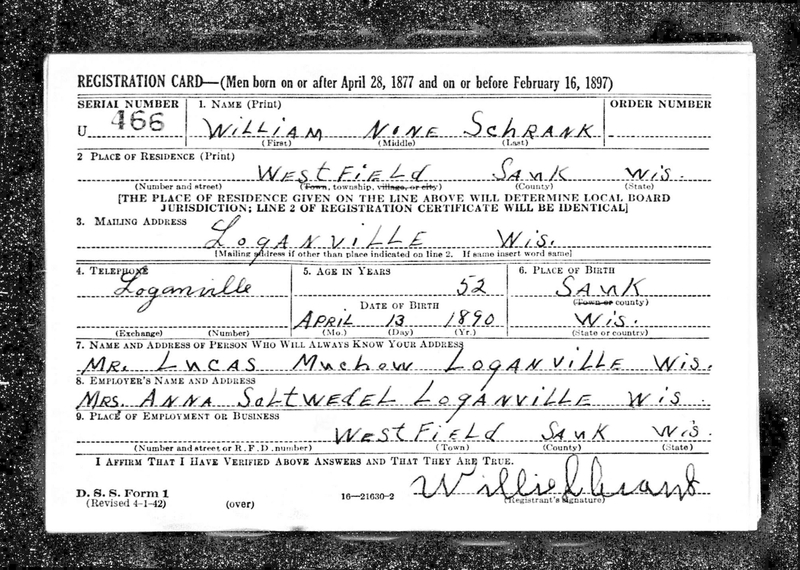 Louise Schrank was born at Westfield, Sauk, Wisconsin, on 12 March 1884. She was the daughter of Ferdinand Schrank and Bertha Roloff. Louise Schrank married Herman H. Schulenburg, son of Henry Schulenburg and Elizabeth (? ), on 16 August 1911 at St. Peter's Lutheran Church, Loganville, Sauk, Wisconsin. Louise Schrank died on 17 December 1974, at age 90. Her body was interred after 17 December 1974 at Loganville, Wisconsin, at St. Peter's Lutheran Cemetery. She was born at Westfield, Sauk, Wisconsin, on 17 March 1886. 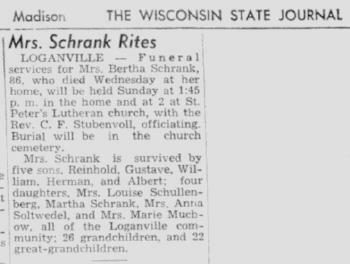 Martha Schrank died on 4 April 1966 at Loganville, Sauk, Wisconsin, at age 80 Miss Martha Schrank, 80, died Monday at the home of a sister. Married Name circa 1912 As of circa 1912,her married name was Soltwedel. 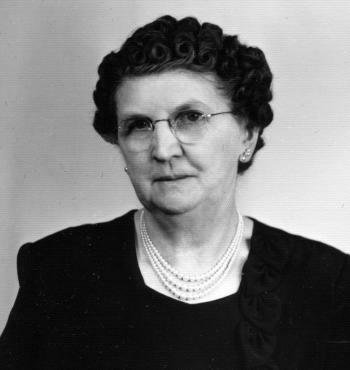 Anna B. Schrank was born at Westfield, Sauk, Wisconsin, on 24 May 1888. Anna B. Schrank married August Frederich Soltwedel, son of George William Soltwedel and Anna Mathilde Dorathe Gade, circa 1912. 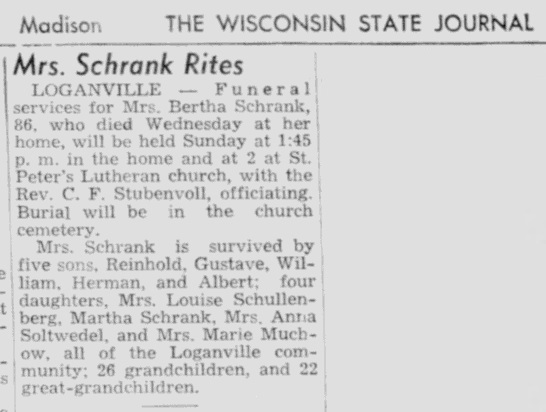 Anna B. Schrank died in June 1951 at at hospital, Madison, Dane, Wisconsin, at age 63 Anna (Schrank) Soltwedel obituary. [S243] U.S. Federal Census 1920 U.S. Federal Census, by Ancestry.com, ED171. Dwelling 183. [S250] U.S. Federal Census 1930 U.S. Federal Census, by Ancestry.com, ED56-39. Dwelling 141. Name Variation William Schrank was also known as Willie. William Schrank was never married. He was born at Westfield, Sauk, Wisconsin, on 13 April 1890. 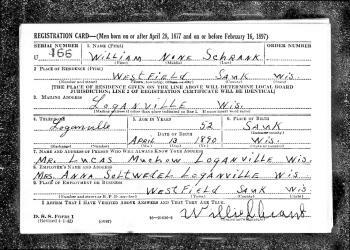 William Schrank died on 10 November 1965 at Loganville, Sauk, Wisconsin, at age 75 Willie Schrank, 75, died Wednesday in Loganville. On 5 June 1917 at WWI Registration, Sauk, Wisconsin. 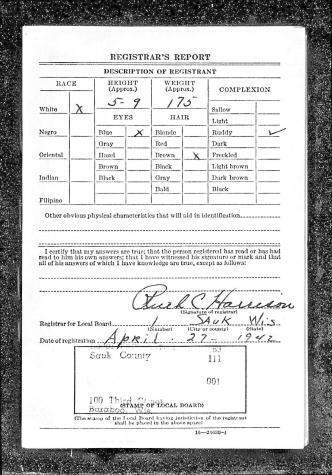 On 27 April 1942 at WWI Registration, Sauk, Wisconsin. Name Variation Marie Schrank was also known as Mary. Name Variation Marie Schrank was also known as Maria. 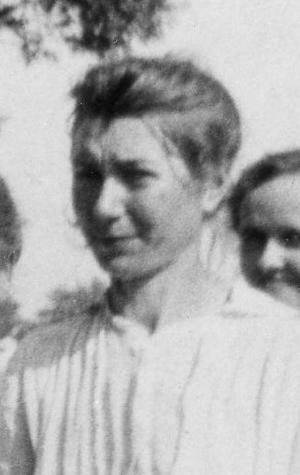 Marie Schrank was born at Westfield, Sauk, Wisconsin, on 19 March 1892. Marie Schrank married Lucas Reinhold Muchow, son of Gustave C. Muchow and Bertha A. Krueger, circa 1914. 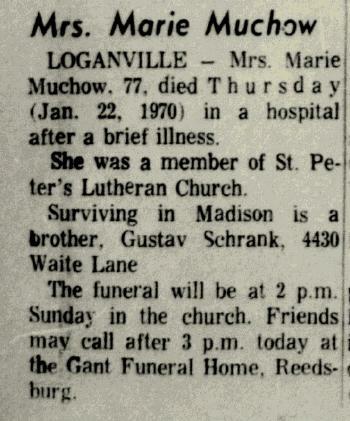 Marie Schrank died on 22 January 1970 at Wisconsin at age 77 Marie (Schrank) Muchow obituary. 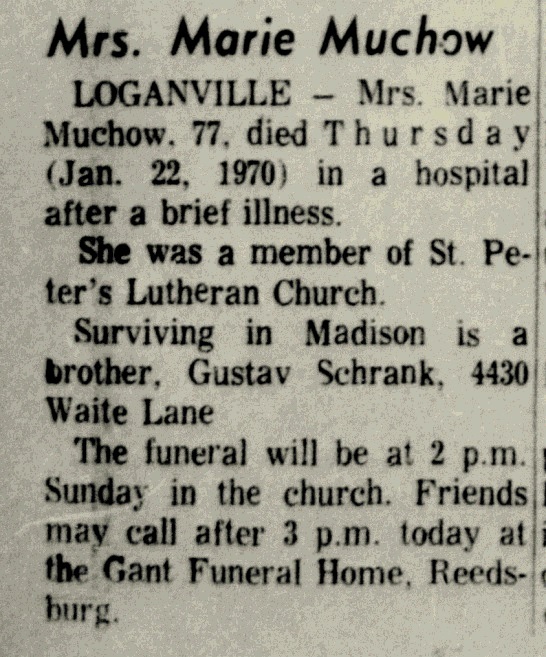 She was buried after 22 January 1970 at Saint Peters Lutheran Church Cemetery, Loganville, Sauk, Wisconsin. [S250] U.S. Federal Census 1930 U.S. Federal Census, by Ancestry.com, Year: 1930; Census Place: Westfield, Sauk, Wisconsin; Roll: 2609; Page: 6A; Enumeration District: 39; Image: 526.0. 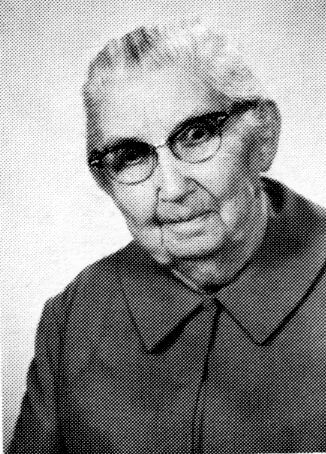 Augustine Bertha Schrank was born at Westfield, Sauk, Wisconsin, on 27 February 1894. Augustine Bertha Schrank died before 1900. 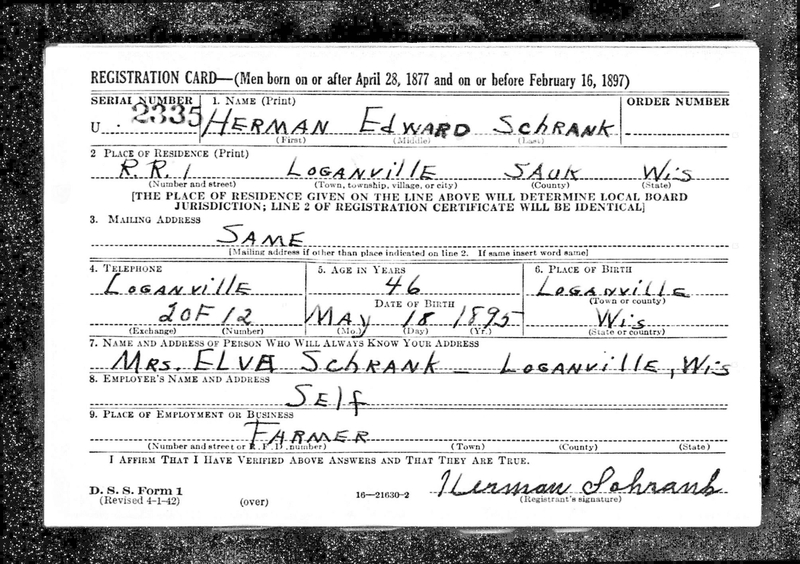 Herman Edward Schrank was born at Westfield, Sauk, Wisconsin, on 18 May 1895. 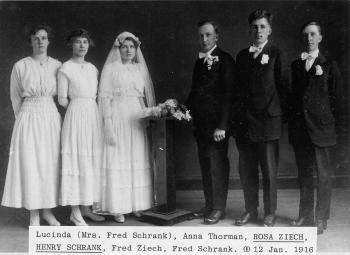 Herman Edward Schrank married Elva E. Steckelberg, daughter of Henry W. Steckelberg and Anna Schuette, on 22 November 1920. Herman Edward Schrank died in March 1983 at age 87. 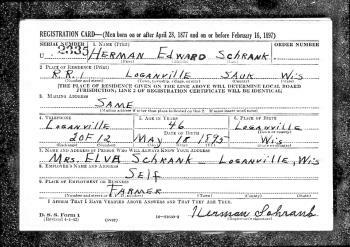 Herman Edward Schrank obtained US Social Security Card at Wisconsin; last residence Loganville, Sauk, Wisconsin. 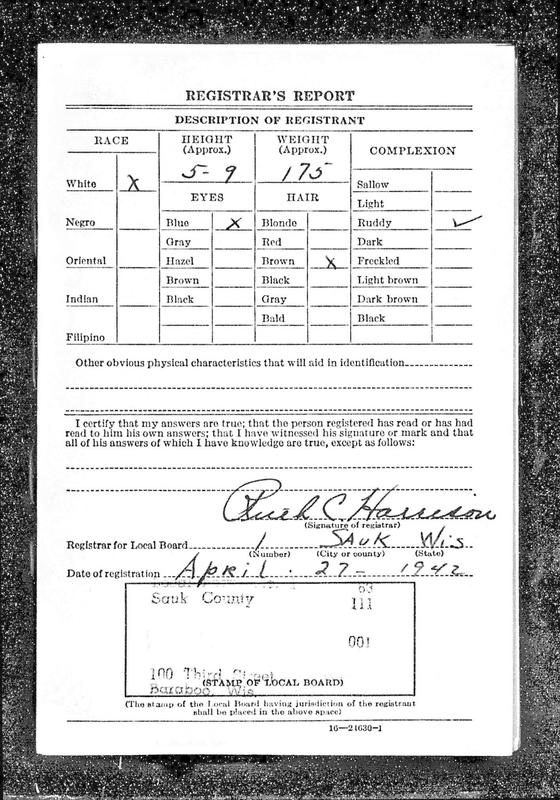 On 25 April 1942 at WWII Registration, Sauk, Wisconsin. 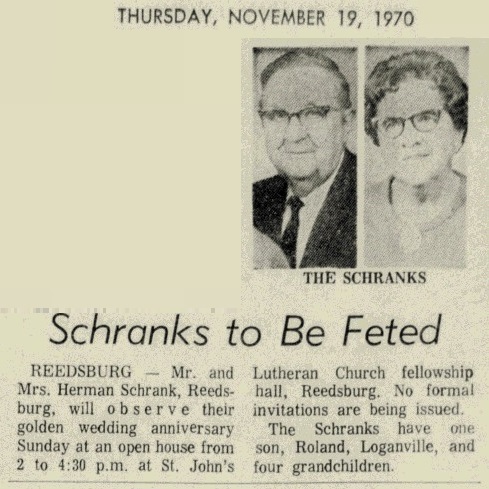 On 22 November 1970 at Reedsburg, Sauk, Wisconsin, Mr and Mrs Herman Schrank golden wedding anniversary. [S244] U.S. Federal Census 1910 U.S. Federal Census, by Ancestry.com, Dwelling 104. ED 130. [S244] U.S. Federal Census 1910 U.S. Federal Census, by Ancestry.com, ED130. Dwelling 104. Albert Wilhelm Schrank was born at Westfield, Sauk, Wisconsin, on 24 January 1899. 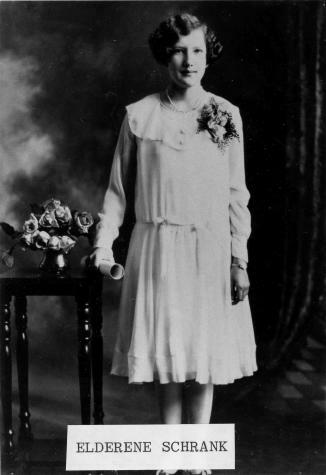 Albert Wilhelm Schrank married Elda F. Roecker, daughter of William Charles Roecker and Mary Katharena Meyer, circa 1927. He died in November 1973 at age 74. Albert Wilhelm Schrank obtained US Social Security Card at Wisconsin; last residence Reedsburg, Sauk, Wisconsin. On 12 September 1918 at WWI Registration, Sauk, Wisconsin. On 7 June 1935 at Roecker sister's families visit Mr and Mrs H O Hinrichs and their sons, Harley and Herman, 1820 Spaight st., visited last Friday and Saturday with Mrs. Hinrichs' brother-in-law and sister, Mr and Mrs Albert Schrank, Loganville. 09 June 1935 Wisconsin State Journal (Madison, WI). 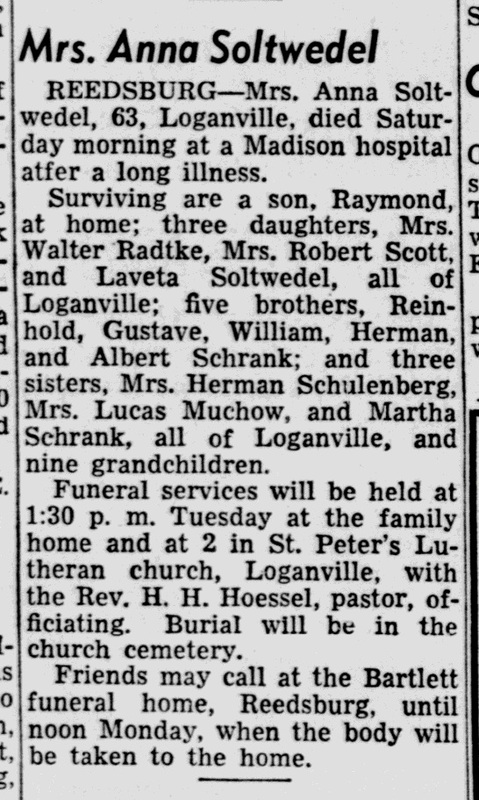 In November 1938 at Sauk, Wisconsin, Mr and Mrs H O Hinrichs and their son, Harley and Herman, 1820 Spaight st., motored to Loganville and visited with Mrs Hinrichs' brother-in-law and sister, Mr and Mrs Albert Schrank. [S250] U.S. Federal Census 1930 U.S. Federal Census, by Ancestry.com, ED56-39. Dwelling 138. Married Name 27 September 1905 As of 27 September 1905,her married name was Schrank. Emma Steckelberg was born in August 1884 at Wisconsin also reported as Aug 1883. 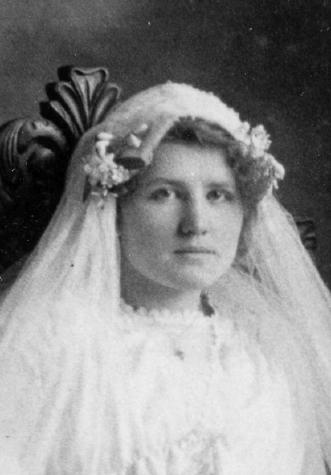 Emma Steckelberg married Gustave Reinhold Schrank, son of Ferdinand Schrank and Bertha Roloff, on 27 September 1905 at St. Peter's Lutheran Church, Loganville, Sauk, Wisconsin. 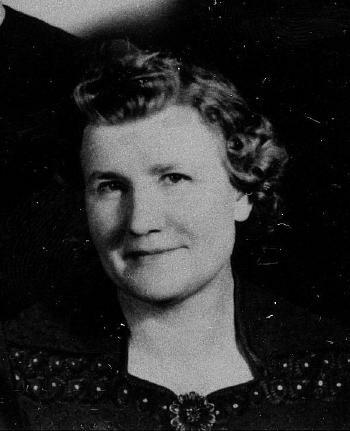 Emma Steckelberg died on 30 August 1969. Name Variation Heinrich Marvin Gustav Schrank was also known as Hank. Nickname Heinrich Marvin Gustav Schrank also went by the name of Henry M.
Heinrich Marvin Gustav Schrank was born at Loganville, Wisconsin, on 14 February 1906. He was the son of Gustave Reinhold Schrank and Emma Steckelberg. Heinrich Marvin Gustav Schrank died on 18 June 1947, at age 41. Married Name 14 May 1948 As of 14 May 1948,her married name was Mattke. Wanita Bertha Catharina Schrank was born at Loganville, Wisconsin, on 8 September 1910. She was the daughter of Gustave Reinhold Schrank and Emma Steckelberg. 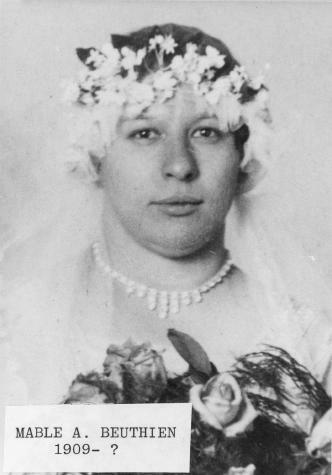 Wanita Bertha Catharina Schrank died on 11 April 1966, at age 55. Married Name 26 July 1933 As of 26 July 1933,her married name was Nelson. 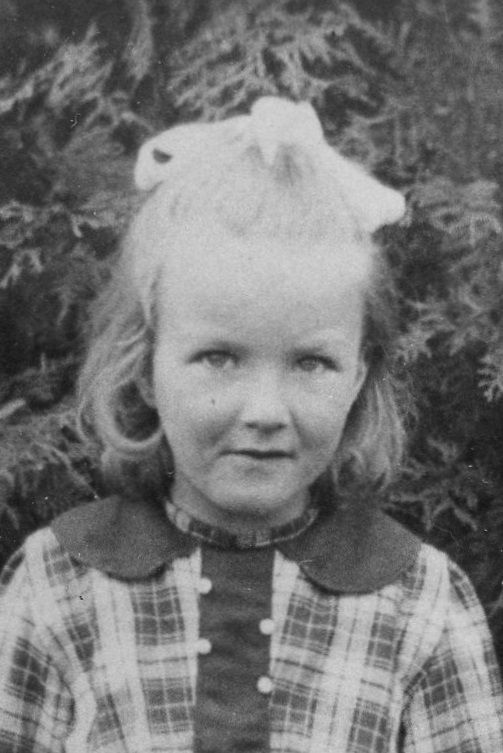 Helen Anna Elisabeth Schrank was born on 24 May 1914 at Loganville, Sauk, Wisconsin. 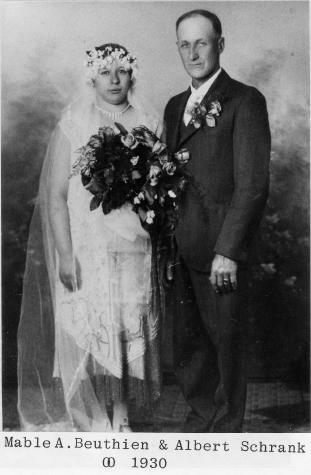 Helen Anna Elisabeth Schrank married Roland C. Nelson, son of Nels Peter Nelson and Leona May Bodendein, on 26 July 1933. Helen Anna Elisabeth Schrank died on 1 March 2014 at age 99 Helen A. Nelson, age 99, of Sun Prairie, formerly of Madison, passed away on Saturday, March 1, 2014, at the Highlands House in Sun Prairie. She was born on May 24, 1914, in Loganville, Wisconsin, the daughter of Gustave and Emma (Steckelberg) Schrank. On July 26, 1933, Helen was united in marriage to Roland C. Nelson. This marriage was blessed with two children. She was a member of the Elks Club, and she also enjoyed spending time sewing, golfing, doing crossword puzzles and loved to bake and cook. 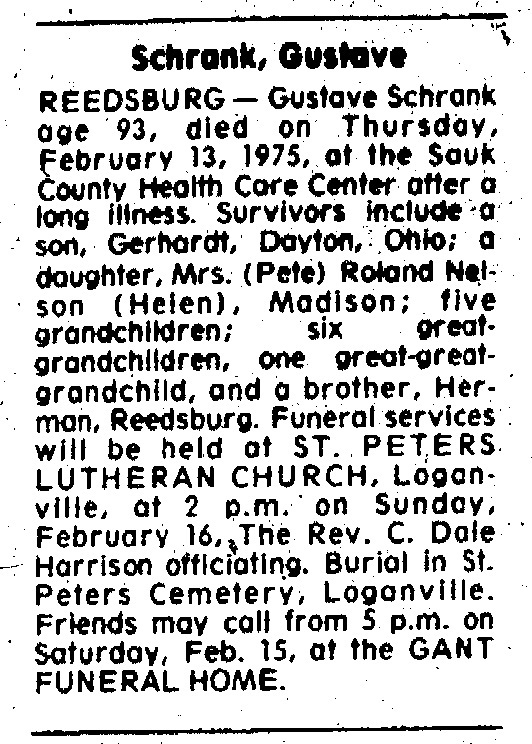 A graveside service for Helen Nelson will take place in St. Peter’s Lutheran Cemetery, Loganville, WI on Thursday, March 6, 2014, at 1:00 P.M. The family is requesting memorials of remembrance be made to The Highlands House 1326 Armagh Lane, Sun Prairie, WI 53590, or Agrace Hospice Care 5395 E Cheryl Parkway, Madison, WI 53711. She was buried after 1 March 2014 at Saint Peters Lutheran Church Cemetery, Loganville, Sauk, Wisconsin. Name Variation Gerhardt Benjamin Harry Schrank was also known as Gary. 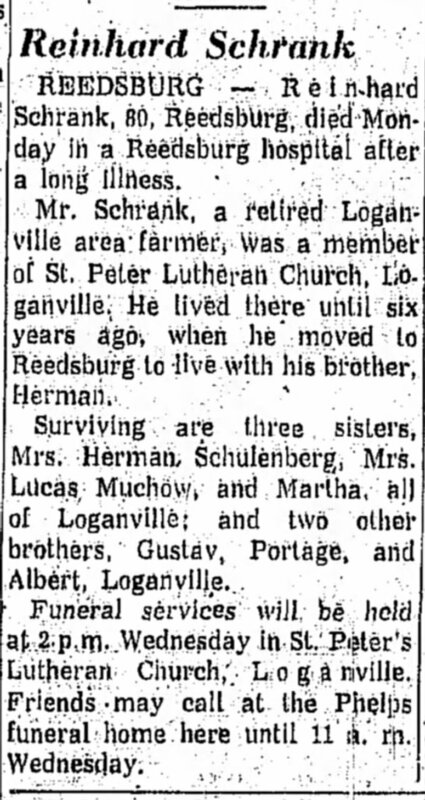 Gerhardt Benjamin Harry Schrank was born on 3 March 1919 at Loganville, Sauk, Wisconsin. Gerhardt Benjamin Harry Schrank married Margaret Beryl Harden after 1979. Gerhardt Benjamin Harry Schrank died on 29 September 2012 at Ohio at age 93 SCHRANK, Gerhardt (Gary) Benjamin 93, passed away Saturday, 29, 2012 at Bethany Lutheran Village in Centerville, OH. 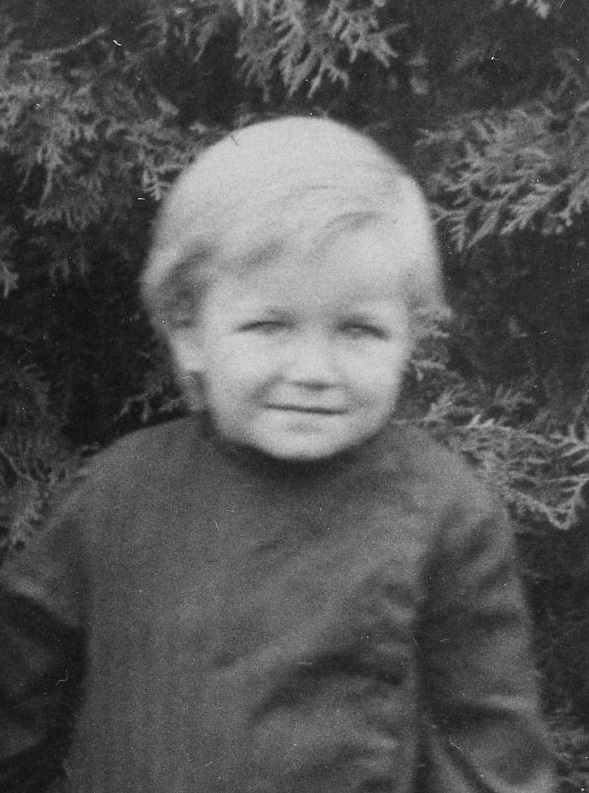 Gary was born March 3, 1919 to Gustav and Emma (Steckelberg) Schrank in Loganville, Wisconsin, the youngest of 3 children. 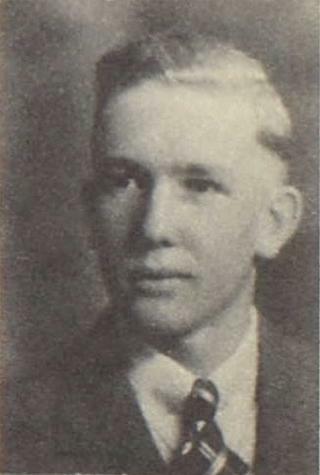 He graduated from Reedsburg High School in 1938. Gary went on to graduate from Iowa State University with a Bachelor's Degree in Engineering in 1947. Gary enjoyed a long career in the automotive industry, where he was a Supervisor of Process Engineering for Delco Products, in Dayton, Ohio. He was employed at Delco for more than 30 years until his retirement in 1985. Gary loved to spend time with his family and friends. He enjoyed camping, playing bridge, reading, and travelling both domestically and internationally. Gary was also a member of Masonic Lodge #661. Gary is survived by his sons, Mark Schrank of Beavercreek, and Scott Schrank of Memphis; Step Children; Cathy Speelman (David) of Ashtabula, Mike Gribler (Becky) of Cincinnati, and Jeff Gribler of Philadelphia; 10 grandchildren and 17 great grandchildren; sister Helen Nelson of Madison. Gary was preceded in death by his first wife Arbutus Ann, his second wife Beryl and daughter Wendy Ann. The family will receive friends at the TOBIAS FUNERAL HOME-FAR HILLS CHAPEL, 5471 Far Hills Ave. at Rahn Rd. Monday, October 1, 2012 from 5 to 7 pm, followed by a funeral service at 7 pm. Pastor Stephen H. Kimpel officiating. Burial will be at Loganville cemetery, in Loganville, WI. 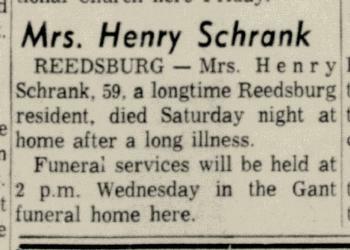 Gerhardt Benjamin Harry Schrank graduated in 1937 at Reedsburg High School, Reedsburg, Sauk, Wisconsin.